The angel hierarchy, as it is known nowadays, has changed over time. 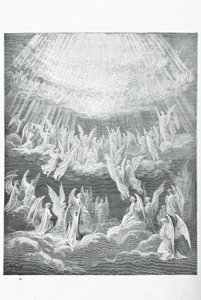 In the Old Testament, only two orders of angels are mentioned: the Seraphim and the Cherubim. In the New Testament, other types of angels are mentioned (the Thrones, for example). However, the Bible does not mention a distinct hierarchy of angels. During the middle ages, Christian theologians suggested several angelic classifications, each consisting of several angel choirs. The most commonly accepted angelic hierarchy is the one that Pseudo-Dionysius the Areopagite proposed. His idea was first presented in his work The Celestial Hierarchy. According to him, angelic hosts were divided into nine orders (listed below). Many other versions of the angel hierarchy drew from or expanded upon Pseudo-Dionysius's idea. Thomas Aquinas grouped the nine angelic orders into three categories, also known as spheres. Thus, the first sphere groups the Seraphim, the Cherubim and the Thrones. You will find the full list of the angel choirs and spheres below. By the way, you will also find different angel hierarchies and/or categorizations in Jewish, Islamic and Zoroastrian traditions. In this article, I focus on the Christian view of the angel hierarchy. The Christian angel hierarchy divides angels by rank, in the following order: Seraphim, Cherubim, Thrones, Dominions, Virtues, Powers, Principalities, Archangels, and Angels. In this classification, the angel choirs are grouped into what is called a sphere or triad. Each sphere consists of three different angel types. This idea was first introduced by Thomas Aquinas who was also known as the Angelic Doctor. Aquinas wrote about his ideas about angels in his book Summa Theologica. Saint Bonaventure refers to these three spheres as the Epiphania, the Hyperphania, and the Hypophania, respectively. Seraphim - According to Christian theologians, of all the angels, the Seraphim (singular Seraph) are the closest to God. Their name means "The Burning Ones", and their primary mission is to protect the throne of God. They constantly praise God and his creation. The Seraphim are mentioned in the book of Isaiah. They are described as having six wings: two cover their faces, two cover their bodies, and two cover their feet. Cherubim - These Cherubim (singular Cherub) are not the chubby baby angels we see in well-known works of art. The Cherubim mentioned in the Bible are fierce angels, and they are described as having four faces: one of a man, one of an ox, one of an eagle, and one of a lion. Their mission is also to protect the throne of God. Thrones - From the Greek thronos (literally meaning throne or highly ornamented chair), the Thrones embody God’s divine justice. They are mentioned in the books of Colossians and Revelations (New Testament). Note: The Ophanim (singular Ophan, also known as Wheels) are closely associated with the Thrones. They are mentioned in the book of Daniel and are described as appearing as a wheel within a wheel, with the Thrones moving within the wheel. Dominions - These angels are also known as Lordships or Leaders. According to non-canonical sources, they look like humans but with wings. Virtues - Also known as Strongholds, the Virtues are in charge of supervising the movements of celestial bodies. They are associated with power and strength. Powers - These celestial beings are warrior angels and are in charge of administering and distributing power among nations and individuals. The angels belonging to the third sphere of the angel hierarchy serve as divine messengers and protectors. Unlike the angels of the previous spheres, these angels are in more direct contact with humans. Principalities - Also known as Rulers, the Principalities work closely with the Powers. Their primary function is to look over groups of people. Archangels - Archangel comes from the Greek archangělǒs, which means chief angel. Thus, it means that the archangels are the highest ranking angels. Although many Christian theologians placed them in the lowest sphere, many others believe that they are among the most powerful of angels. Of all angels mentioned in the Bible, only Michael is referred to as "the archangel". Raphael is another archangel. He is mentioned in the Book of Tobit. In this book, Raphael is quoted as saying that he is one of the seven archangels who stand before God. According to Pseudo-Dionysius, the seven archangels are Michael, Jophiel, Chamuel, Gabriel, Raphael, Uriel, and Zadkiel. According to certain metaphysical teachings, each of these archangels works on one of the Seven Rays. Angels - The Angels are the lowest ranking angels, and the closest to humankind. They are also the most recognized. They are God’s messengers and also serve as intercessors. Their tasks also include: protecting, guiding, and inspiring human beings. It is said that each person has a guardian angel. Mystics claim that there are also "angel specialists". For example, there are angels of healing, angels of protection, angels of love, angels of abundance, etc. A similar angel hierarchy to the one presented on this page appears in the Divine Comedy, the classic epic poem by Italian poet Dante Alighieri. This poem popularized the concept of the nine choirs of angels. The following is an excerpt from the Divine Comedy in which Dante and Beatrice marvel at the nine angel choirs. It was translated by Henry Wadsworth Longfellow. "The three Divine are in this hierarchy,First the Dominions,and the Virtues next;And the third order is that of the Powers.The in the dances twain penultimateThe Principalities and Archangels wheel;The last is wholly of angelic sports.These orders upward all of them are gazing,And downward so prevail, that unto GodThey all attracted are and all attract." Regardless of these classifications, I believe that you can always call on angels to ask for help, guidance, inspiration, healing, protection, or whatever you or your loved ones may need.